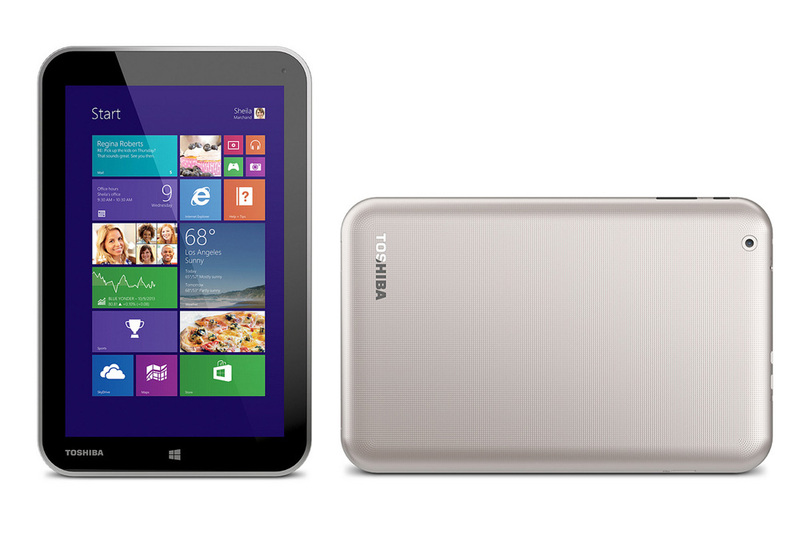 The Toshiba Encore 8 is one of the latest tablet PC featuring Intel’s Bay-Trail-T Atom processor. The tablet is aimed towards mainstream users and costs around the $299 range which is a steep price when compared against the competition. 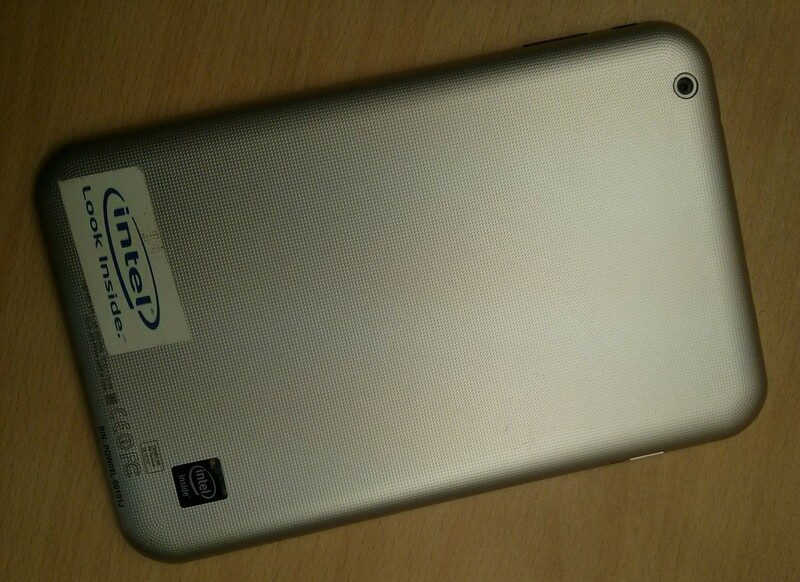 As an Intel Tablet, it should be no doubt that the hardware it features is also made by Intel itself. Under the hood, the Encore 8 packs a Atom Z3740 (Bay-Trail-T) processor which is a Quad core CPU clocked at an impressive 1.86 GHz and coupled with the powerful Intel HD 4000 graphics chip. 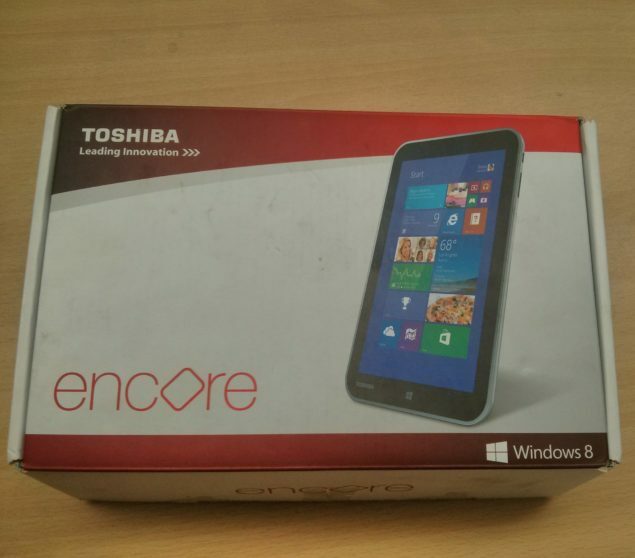 The packaging of the tablet is quite simple, its shipped in a box package with pictures and logos of Toshiba and Encore brands. The back of the box includes marketing details such as Play more, Surf more, Chat more along with a couple of images of the Toshiba Encore 8 tablet itself. The only stuff the box includes are the tablet itself, a Micro USB cable and a wall socket charger. There are a couple of documents such as warranty and setup guide included in the box just for the sake of including them. 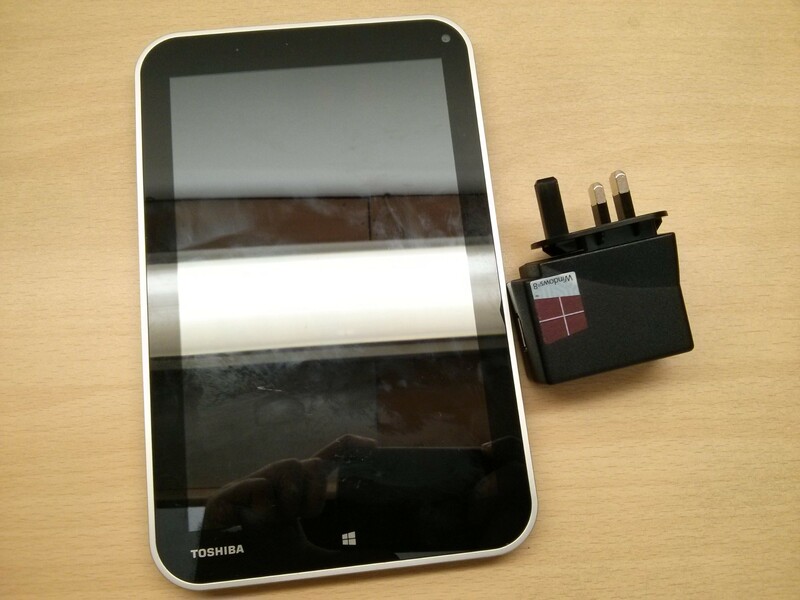 Weighing in at 450 grams, the Toshiba Encore is heavier and bulkier than both the Nexus 7 (2014) and iPad Mini. The large tablet is hard to hold some times although the curved edges help maintain some control but it just isn’t enough. It is engulfed by a large plastic body on its back that doesn’t include a soft back to hold like its rivals. The back is colored silver with a Toshiba logo etched in the center. The front is mostly covered with the display which is surrounded by thick black bezels, a thin metallic silver frame runs through the sides of the tablet. 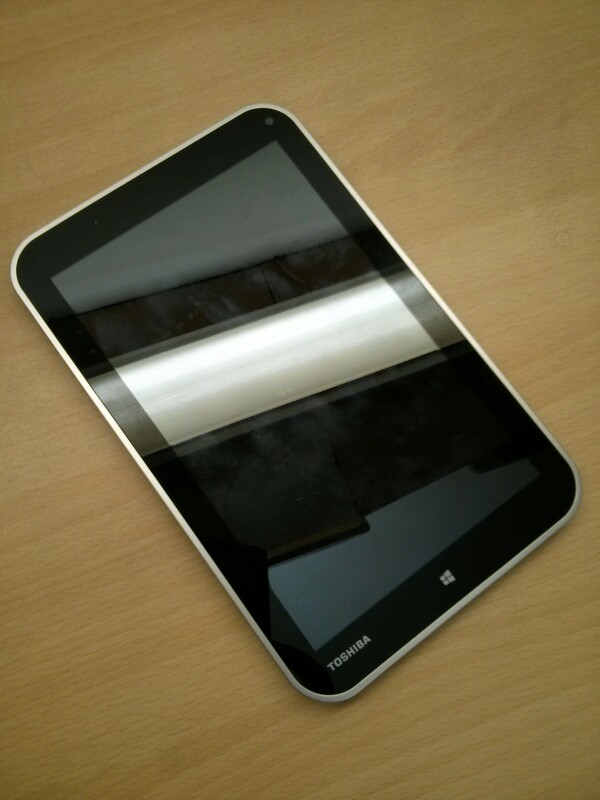 The exact dimensions of the tablet are 213 x 135.9 x 10.68 mm (W x D x H). There’s a single capacitive Windows Home page button at the bottom of the display which let’s users access both Windows desktop and Windows tablet modes (Windows 8.1 tiles). The volume rocker has been placed on the side for use in vertical mode as well as the lockscreen/power button has been placed on the same horizon as well which is similar to what other tablet manufacturer’s are currently doing. The rest of the input and output ports such as Micro HDMI, Micro-USB, Audio Jack have been placed on the top and are easily accessible. The Micro-SD card slot has been placed on the opposite side of the volume control and On/Off switches which can be accessed from there easily. On the bottom, there are two speakers which, rather facing towards you, direct the sound towards the bottom side so it can vibrate easily. The back also sports a rear 2MP camera and unlike many tablets on the market, this variant does not come with any flash. The front camera is rather good with 8-MegaPixel quality capture and up to 1080p HD Video recording. 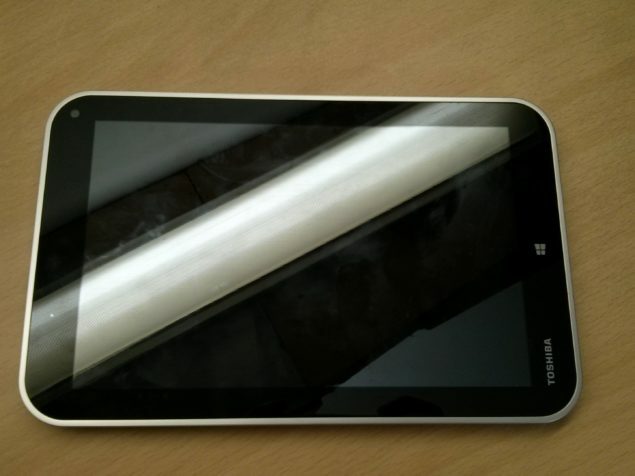 The 8 Inch Toshiba Encore 8 tablet sports a IPS display panel which boasts a resolution of 1280×800 enabled with 5 point multi-touch capability. The 8 inch panel is more than enough for any tablet and provides enough room for easy and accessible maneuverability across the screen however the screen resolution makes waste of the graphic hardware installed inside the heart of the tablet PC. The 189ppi display isn’t the best you get for the money but the quality isn’t the worst either and is pretty usable for reading documents and browsing web pages. Size wise, this is a 8 inch widescreen LCD with a resolution of 1280 X 800 pixels and 720p video playback. The viewing angles are great and even if compared to the better resolution boasting Nexus 7, the tablet does a good job keeping up with it due to the IPS panel keeping the brightness just accurate and colors vivid at the same time. However, I still believe that a higher resolution LCD Display would have been a better choice since there’s a lot of horsepower which the tablet has that’s just being gone to waste. For where it loses ground, the Encore 8 makes up with its speed thanks to its Intel Atom powered processor. The Atom Medfield Z3740 Quad Core processor idles at 1.33 GHz and goes up to 1.8 GHz under normal operation. It has the hardware capabilities of a modern day tablet and the performance efficiency’s great due to Intel’s latest 22nm Bay Trail-T architecture. The CPU supports up to 4 GB of LPDDR3 memory however the Tablet is equipped with 2 GB of LPDDR3 memory with frequency of 1066 MHz and max memory bandwidth of 17.1 GB/s. Since the tablet runs Windows 8.1, I was able to test it with several x86 based benchmarks such as CineBench R11.5 where it scored 1.25 points in Muilt-threading, 2356 points in PCMark 7 and 1022 in PCMark 8 (Test for Experts and professionals). Now, I have been calling the resolution of the tablet to be a downside since it wastes the potential of the Intel HD 4000 graphics chip featuring support for Quick Sync Video, Clear Video HD, Wireless Display and Intel Insider. The chip clocks between 311 MHz at idle and 667 MHz on burst frequency and has the same standard as Intel’s Ivy Bridge CPUs featuring 16 Execution Units with DirectX 11 and Shader Model 5.0 support. In the latest 3DMark, the graphics were able to score 16774 points in IceStorm and 1331 points in Cloud Gate benchmark which is good enough. The Toshiba Encore 8 itself comes stock with 32 GB storage (23.5GB usable) which is quite enough for the average tablet user out there OR if you’d like, you can add an additional additional storage via it’s microSD slot. The tablet comes in a 64 GB variant too so heavy storage and apps users can opt towards the other model for an added price. Besides that, the Encore 8 has a 3.5 mm jack, WiFi, Bluetooth 2.1, a mini HDMI out, and a micro USB jack for data transfers or hooking up an OTG cable. The tablet comes with the Microsoft Windows 8.1 operating system as stock. It runs great and while it doesn’t offers the wide range of applications like Google Play, it does come with a tons of other applications that can be downloaded for the regular desktop version. However, most of the applications are more optimized for mouse and keyboard on the desktop version and there’s no add in keyboard or mouse options other than the on-screen features that are already available on tablets and feel rather clunky to use. The Windows desktop mode isn’t all that great either, there are some regular slow downs once you run several applications on the same time making the tablet unable to work for a long period of time unless the apps start or you manually end processes. In this specific case, the tablet mode becomes the obvious choice since it requires lesser resources. The desktop version feels as good as the normal version you see on your PCs except that this runs on a smaller screen and you don’t have access to mouse and a full sized keyboard. Including both front and back camera is a good addition to the tablet from Toshiba. The main camera is rated at 8-MegaPixel with 1080p Video recording support while the front camera is rated a 2-MegaPixels and is an ideal choice for video chatting applications. Video recording is at 1080p while video playback is featured at 720p. The video recording is great from the main camera but the front camera is ok when using skype and other video chat services. The 2-Cell Li-Ion 5000 mAh battery to be exact runs for a long duration. Toshiba officially mentions around 7 hours of 720P Video playback, 50h Audio Playback, 14.5 hours User scenarios which include web, video and standby operating environments and 6 week system off duration. In my personal testing, the battery toned down to 76% after an hour of browsing on full charge and 62% after an hour of playing Halo: Spartan Assault which is a decent amount of battery life that is offered. Powered by Intel’s latest Silvermont architecture based on the 22nm process, the Toshiba Encore 8 Windows 8.1 tablet is powerful indeed but its backed by a steep pricing of $299 US which is a lot more than its competitors that are currently offering more accessible and user friendly experiences. There are several issues and major performance drawbacks on the desktop version of Windows 8.1 due to the limited amount of memory and most of the graphics power is gone to waste due to the low resolution display whereas competitors are offering 1920 x 1080 and better resolution screens for the same competitive pricings. Most of the storage space is gone to the large installation size of Windows making only 23.5 GB usable of the total 32 GB storage. The speakers and sound quality isn’t the best either and fails to give a good user experience. Aside from that, the design is pretty mediocre giving a cheap plastic look and silver mesh that fails to impress me. From a technical perspective, the Toshiba Encore 8 is a good choice but from a pricing perspective and usability, the tablet will fail to impress the regular tablet user. The desktop mode does have several advantages and with Microsoft’s regular updates, they can be easily addressed but the chunkiness of the operating system has to get solved before I advise anyone to go for the Encore 8 over a Android based Tablet.